First, I’ll say this was not a suprise to me, as Taterware is not certified as compostable by theBiodegradable Products Institute (BPI). Further, I have reports on my desk from Cambridge Polymer Group which state that Taterware is made up of 73% polypropylene (or plastic). I imagine though that this will come as quite a surprise to the many business owners & consumers that use Taterware everyday, expecting it to compost in a commercial composting facility. Something that many folks don’t know is that “biodegradable” does not mean “compostable”, and while Taterware is labeled biodegradable it was never certified compostable. I am happy to say that our food ware partner, World Centric, uses cutlery that has been 3rd party tested as containing no plastic and is currently under process of ASTM 6400 testing. (Further speaking to the integrity behind World Centric, they share on their website, that they were previously using cutlery which despite being BPI certified and meeting ASTM standards was found to be not fully compostable. They discontinued the corn-resin which was causing the issue and have now had their utensils re-tested and confirmed as fully compostable containing 0% PP). If you have further questions, there’s a Whole Foods contact (noted in the sign) that you can reach out to. 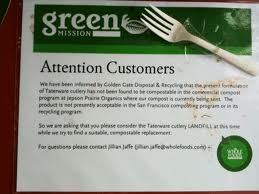 We’ll be reaching out to Whole Foods to see if they’re interested in switching over to World Centric’s compostable cutlery: a mix of 70% non-GMO PLA and 30% talc.